The hustle, bustle, sparkle and cheer of the holidays has waned and maybe now that you’ve packed all your holiday decor away, your home looks a little, well, blah? It can happen. After we’ve decked the halls from top to bottom when the lights and greenery are suddenly gone, what remains can look as if it needs a little freshening up. Here are some easy ways to give your home some post-holiday “sparkle”. 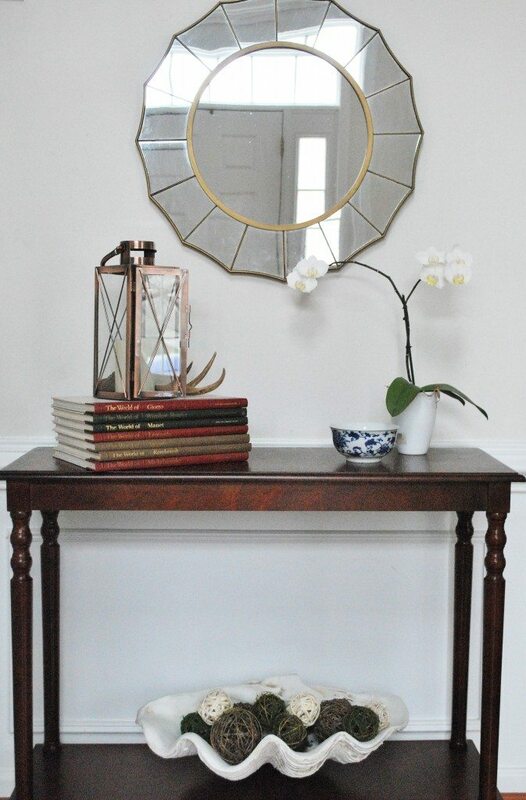 Freshen the Foyer– Your entry greets guests to your home and first impressions matter. 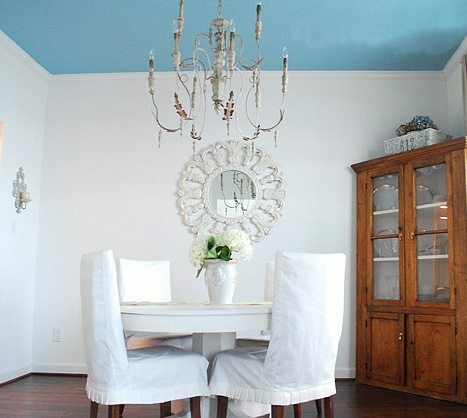 Shop your house for some pretty decor that will brighten up the space. In our entry, I used art books, a fresh floral arrangement and a decorative shell filled with grapevine balls, which add texture. The wall mirror reflects the light from the door brightening the space and the flowers freshen and soften the entry. Go Bold– In formal rooms you often see softer colors, but in this space the black and white stripes on the pillows break up the expanse of white shelving and furniture. The classic color combination works nicely at any time of year, but with days short and less sunlight, bold black and white works well to “wake up” a space. Add Unexpected Color– A fun and completely unexpected way to freshen up a room is to add a bright pop of color to your ceiling. It’s a bit of a surprise in this otherwise white room. This home faces a lake, so the blue color is the perfect compliment to the water outside but ceilings can look amazing in all sorts of different colors. Blues are always popular but dark greys or navy can add interest especially when paired with white or light walls. Pillows Make The Difference– If you aren’t ready to commit to a painting project right now, a very simple trick is to invest in some bright pillow covers. 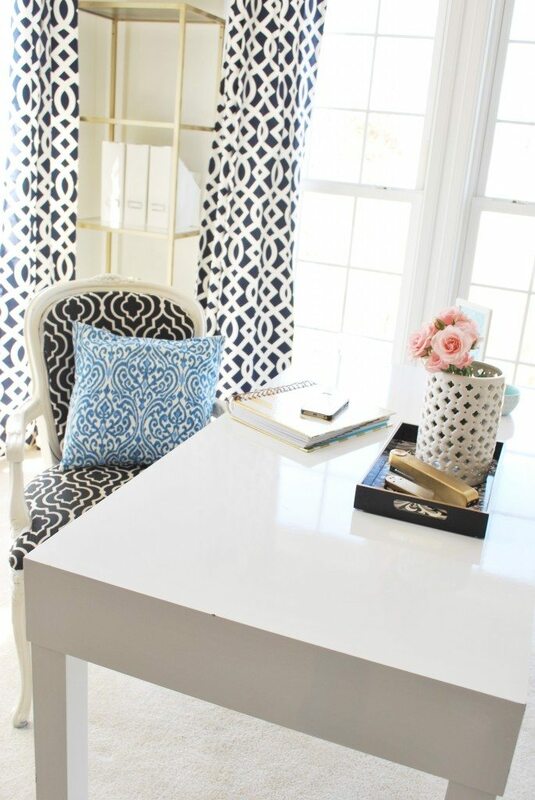 In this home office, the bright blue wakes up the black and white space. 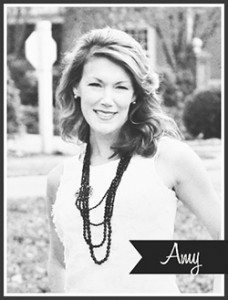 Even one pillow can add interest if it’s in a bright color, and pillow covers are not just inexpensive but simple to switch out when you’re in need of a change. Here is another example of adding bright pops of color, this time bright pink adds fun and interest to this work space. Not only is it a bright, cheerful color but it adds warmth to the space, a nice touch on those dreary winter days. Bright Curtains– Changing out curtains during the year will completely refresh a space. 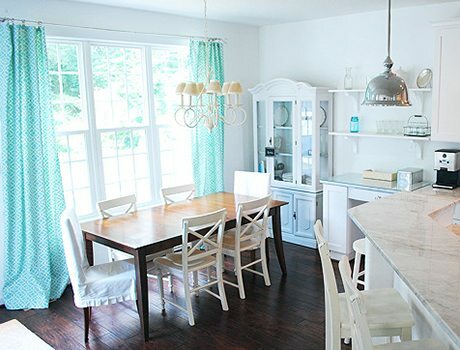 These crisp blue curtains made this kitchen feel fresh during the dark winter months. There are tons of online resources for curtains, or you can make them yourself if you are crafty. Keeping windows covered during colder months also saves on heating bills and keeps the space from looking empty and stark. Add Back Greenery–Both fresh and faux greenery are a great way to make post-holiday rooms feel warmer. Fresh flowers always make a space feel special, but faux greenery in this case a boxwood sphere nested in a wrought iron urn, fills unused space. These accessories add some green back into the room long after the holiday decor is packed away. Freshen Up The Unexpected–Keeping your practical spaces decorated and neat gives your home a sense of calm, but that doesn’t mean these spaces have to be boring. Add pillows to a bench, some decorative bins, and even an unexpected wall treatment in an open closet to brighten up the space. 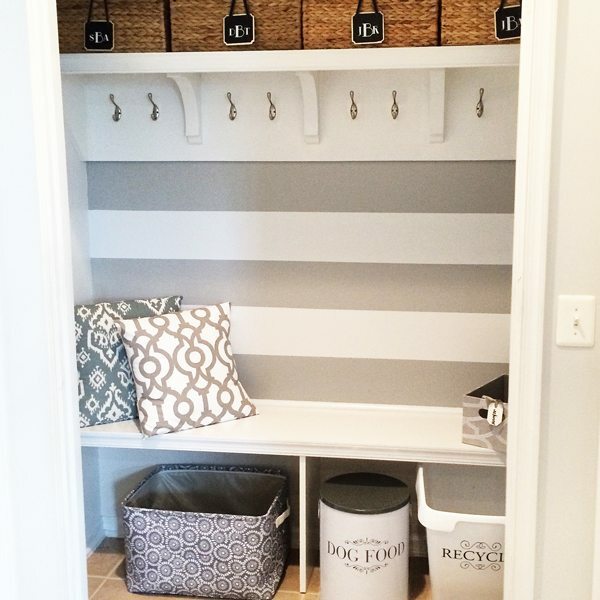 The painted stripes on a wall take a practical space like this one and make it interesting and fun. Decorate! –Filling in open spaces with decorative items is another way to keep your space feeling fresh. 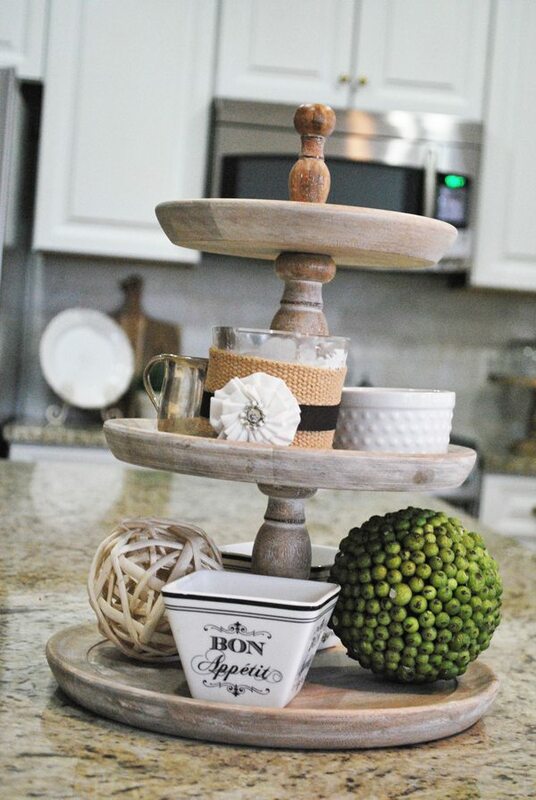 A tiered stand doesn’t have to be just for serving, use it to display interesting items and again, be sure to incorporate pops of green at eye level to freshen up your space. Mixing decorative items in with practical ones in your kitchen make the space feel more inviting during the colder months. And, don’t neglect empty corners– fill spaces, even in the kitchen like this nook, with touches of greenery and warm woods to make the room feel polished and inviting. 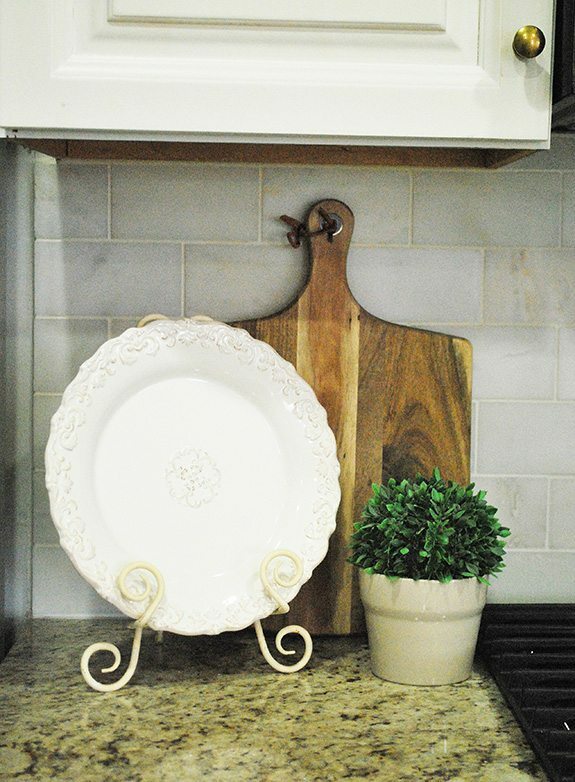 These small touches will go a long way toward making your home feel refreshed after the holidays. 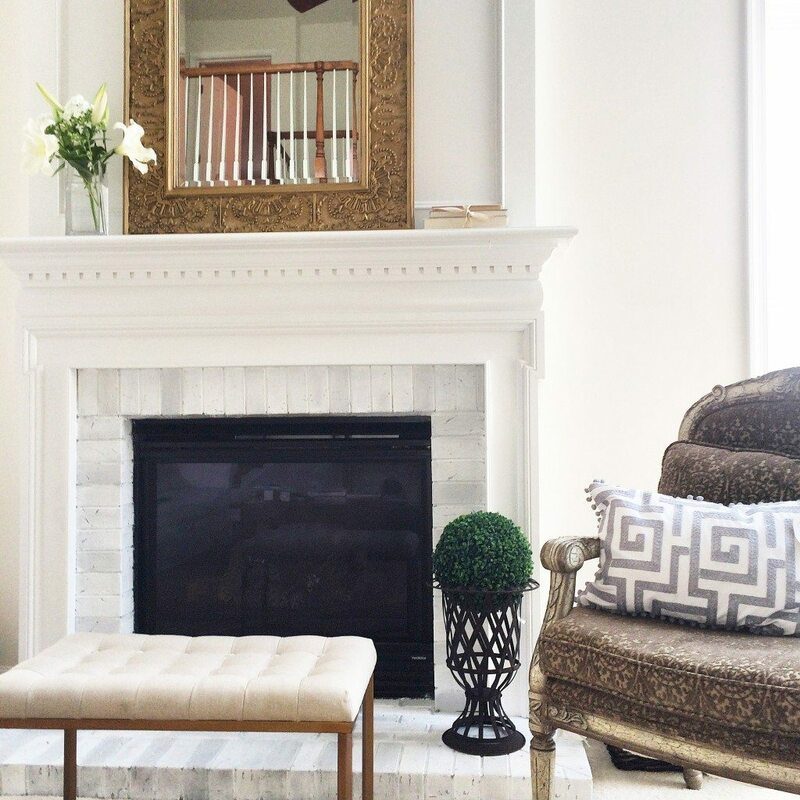 For more decor inspiration, please visit us at 11 Magnolia Lane.